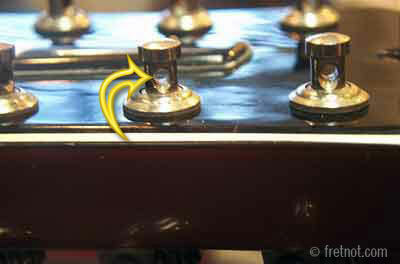 Worn out tuners often have excessive play between the round and worm gear resulting in skipping or play in the tuning machine arm (movement with response from the tuning machine post). Generally speaking, if you can find retrofitting replacements for your instrument this is normally a simple procedure. When the machine head bushing has a nut and washer then it must be removed before the tuners will come out, other simply have press fit bushings when do not need to be replaced if the same design is being used. Post hole useable, but very close to ferrule. Because even the best manufacturers can have problems with a certain design of tuner it is difficult to say which brands are superior across the board. Amongst the brands known for excellent quality are: Waverly®, Schaller® and Gotoh®. If you are replacing your old tuners with identical tuners then you need little more than a screwdriver and nut driver, however, if the original style is not available or not desired some upgrades may require modifications. Care should be taken to avoid chipping the finish or peghead veneer when removing pressed in machine head ferrules. When dealing with vintage instruments it is highly advisable to seek a retrofitting replacement so that no changes are made if possible. The gear ratio indicates how many times the tuner button is rotated 360° to one turn of the tuners post. A higher ratio permits finer adjustments, reducing the aggravation of tuning up and down repeatedly before perfect tuning is achieved. Tuning machine bushings, also called ferrules, are inserted into the front side of the peghead and act as a collar for the post. 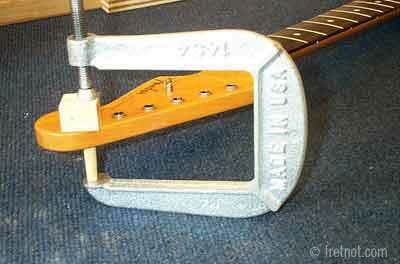 Some bushings screw to the tuner, others are pressed into the peghead and held in place by friction. When removing a press fit bushing care must be taken to avoid chipping the peghead or finish. Some of these bushings are extremely tight. Others have been glued in place in an attempt to keep them from falling out...not recommended procedure. The safest method I have found to remove them is to press them out. Using a simple wood block which I have drilled to match the diameter of the bushing, it is placed over the ferrule and a dowel is used to press it up and out. Sometimes you can do it by hand, on very tight bushings, I must use a clamp. My instrument won't stay in tune, are the tuners at fault? In general, worn out tuners make an instrument hard to tune, loss of tuning occurs when the string is loosing tension. The ferrules that press into the fingerboard don't always fit snuggly. If one isn't careful it is quite easy to loose these when the strings are removed. To tighten the fit of loose machine head bushings without permanently gluing them into the peghead hole I shrink the diameter of the hole. If the gap is minor and does not warrant filling and re-cutting of the hole then I use superglue to build up the walls of the hole until it is smaller in diameter. Again, we do not want to glue the ferrule to the peghead as damage can result when it must be removed. The superglue is applied and completely dry before bushings are re-installed.